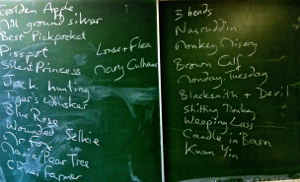 The photo shows the blackboard list I wrote this morning with my 7th class (i.e. 13-year-olds in their 3rd year of English). It was the last lesson of the school-year and we were remembering some of the tales they had heard. Then the bell for the end of the lesson cut us short: "But Mr Martin, there were a lot more stories we haven't got on the list!" Having been a teacher of English in a German secondary school for many years, storytelling has naturally become a major element in my language teaching. Although I do not dispense with the school textbook entirely (we all of us run out of inspiration on occasion), the majority of what a class learns in terms of grammar and vocabulary comes from the listening, speaking and writing activities arising from my storytelling. Much of the written tests are based on the free-writing skills which the students have learnt from the storytelling, too. Decades of classroom work, every day, have been a splendid opportunity to develop new methodology drawing on storytelling. My teacher-training workshops are based not on theories, but on what I have found to be effective in helping learners to learn. Some of these ideas and activities are shown attached to the tales listed here. But as my last school summer holidays are beginning (I shall retire from school 12 months from now), I hope this page outlines for other teachers some of the ways in which storytelling can be used in the classroom. In part, the page also aims to address some of the questions and needs I often notice in the teacher-training workshops I lead. In no way is this meant to be prescriptive: there are many different possibilities to use storytelling. Rather, it is intended to be a brief description of the ways in which storytelling has slowly evolved in my own teaching. Hopefully, it will also enrich yours. It is worth stressing at this point that the teaching ideas outlined here are equally applicable to adult learners - storytelling really is for everybody. Although my day-to-day teaching is with teenagers, I have previously taught adults and many of the teacher-training workshops are specifically aimed at teachers of adult learners. Never make the mistake of assuming that adults will not want to listen to a story. Just try telling one and see how avid they are! Because students want to listen, they will strive to comprehend, even when the language level is above what they fully understand. This situation is similar to how a child learns their mother-tongue: the desire to follow the story encourages a process of working out what unknown elements in the narrative mean to gain a global understanding. I sensed that this listening is the ideal way to provide extensive and intense input of linguistically rich language. Years later I encountered the ideas behind Total Physical Response (TPR) methodology, and met the pedagogical justification for what I had long been doing instinctively. Of course, such an approach will only work if storytelling is a regular and major feature of the classroom situation. Moreover, the listening is not the sole element: there is much more to support the learning process. Although the storytelling restored a more balanced amount of listening to the classroom, talking naturally remains a fundamental aspect of any language-learning process. However, I have found some teacher-training workshop participants conclude that this means their students should soon be telling stories in class. Yet this has never been my aim. Of course students can, and should, be included in the storytelling process; the art form is above all an interactive one. The participation methodology in The Strongest of Them All drew on the wonderful work of others like Margaret Read Macdonald and Andrew Wright. But the talking in my classroom initially arises in large part from my storytelling, be that as partner work, small groups or whole class discussions, rather than students "telling a story as a storyteller". That responsibility in the early years of the foreign language classroom remains with the one person who has the linguistic competence to make that telling powerful: the teacher. The Last-Line Race associated with the Old Woman and her Pig is a good example of a talking activity for the classroom. The teaching suggestions with The Clever Farmer offer talking as well as writing activities, as does the hot seat activity shown with Mr Fox. As a storyteller, the importance of words is obvious. Hence vocabulary extension is a fundamental element of language acquisition. For me, this also means training students to keep a vocabulary book handy on their desk and actively collect words. Unfortunately, that process of training is usually a long and sometimes unwelcome one. Yet it is essential, as is developing the recognition that those words, once collected, need regular learning if they are to move from the passive to the active vocabulary. Yes, regrettably work is required to learn a language, even with storytelling! Nonetheless, the power of the material does provide an incentive to doing the necessary work. After telling a tale I usually collect words from the students that they recall. I try to space these out on the blackboard to place them chronologically in the story. This creates a basic skeleton of the tale, and is a convenient opportunity to address any problems of understanding the plot or clarification of particular words. In my experience, most of the vocabulary will be offered by the students, but I can easily fill in any which I feel should be highlighted. As any language teacher knows, grammar is not something which can simply be introduced, practised with a few exercises and is then magically incorporated into the students' own language production. A few talented learners may be able to do that; for the vast majority it is a slow and fitful process of gradual acquisition. Storytelling, offering a rich range of grammar, is an ideal and highly flexible opportunity to focus students' attention both on new structures and revision. While collecting vocabulary as described above, the current grammar can easily be demonstrated. During the first few years my focus, like that of most teachers, would include phenomena such as tenses, negative and question structures, conditionals, adverbs/adjectives, modal auxiliary verbs, the passive, reported speech: items easily picked up in so many stories. My response was to write a language check-list. I think I first met the idea from Mario Rinvolucri: offering grammar which the student could then fill with their own content. When I consider my students ready, each has a photocopy of the check-list to use when practising free writing. They are encouraged to select from the list those structures they can incorporate in their own writing. They can compare to see that the structures are correct, even tick their list as another point is included. Naturally this does not preclude mistakes. But it does increase awareness that language has a wider range of possibilities and gradually develops the ability to use more of that actively. The language check-list is my input for free writing. The second list is one gradually created by the individual student: we call it the favourite mistake list. Mistakes are rarely made once, corrected, and then never repeated. Like all teachers, I hand back written work with the mistakes highlighted, and invariably my students immediately recognise the vast majority of errors they have made. So often their reaction is "Oh, I've done it again!". This can easily develop into the conviction that they are always going to make that particular "stupid" mistake. In an attempt to cut through this defeatist view, the student's first task on receiving their written work is to go through the mistakes I've marked and cross out with a pencil all those they understand to be wrong. If that understanding is there, I maintain that they had actually "almost learnt" the language before, even if a mistake was still made. Since the correct form is actually understood, the student did not really need to make the mistake. (Admittedly this is a rather simplistic contention. Nonetheless, it is a very helpful one.) Having crossed out the unnecessary mistakes, the student can then count up those left which had to be made because that element of the language had never been learnt or understood properly. If the marking scheme involves a mistake index (mistakes in relation to word total), a new index can be worked out and written down: "This is what I could have written". In my experience students usually need some time to develop an understanding of how to use both of these lists effectively. Above all, many need some time to accept their personal responsibility for the improvement of their written language. Yet that is true of much of teaching. My classroom teaching involves grading. The written element consists of four tests during the school-year, tests which I can largely design myself. Naturally, free writing plays an increasing role in my tests. Indeed, the students are well aware that free writing we do in class and for homework is to be seen as practice for the tests. While the free writing is not always directly related to storytelling, the preceding practice has invariably been so. Moreover, what I regard as a "pure" storytelling test is always my aim when I feel the class has had sufficient training to be able to show how good their English is in a freely-written text. Such a test might consist of my telling the first half of a folk tale like the Grimms' Mother Holle. Here the "good daughter" is cast out into the world, yet her goodness leads to her successful response in certain situations and reaping the eventual reward. At the point when the "bad step-sister" sets out to find such a reward for herself, I stop my telling and the students have about 30 minutes to write their own continuation. Of course, the students know that here this is an English test, and it does not matter whether they finish their story or not. Rather, the priority it to use the writing to show how good their writing skills have become. The test sheet handed to each student contains a short check-list (without examples) to remind them to include a variety of tenses, a range of structures like negatives, questions, modal auxilliaries, conditionals, passive, etc. Any vocabulary specific to the particular tale can also be added to the sheet. Of course, such a test is preceded by practising with similarly structured folk tales. The English folk tale Three Heads in the Well or the Irish tale The Legend of Knockgrafton are further examples of this tale type. As an example, here is a test based on the British folk tale Kate Crackernuts, together with the actual text written by one student. The above outline is neither complete nor prescriptive, but is intended to encourage your own experimentation and discovery. So start telling your students a tale: you might even all live happily ever after.